The freshman congresswoman touched on numerous issues at one of the many Women's Marches held around the nation today. 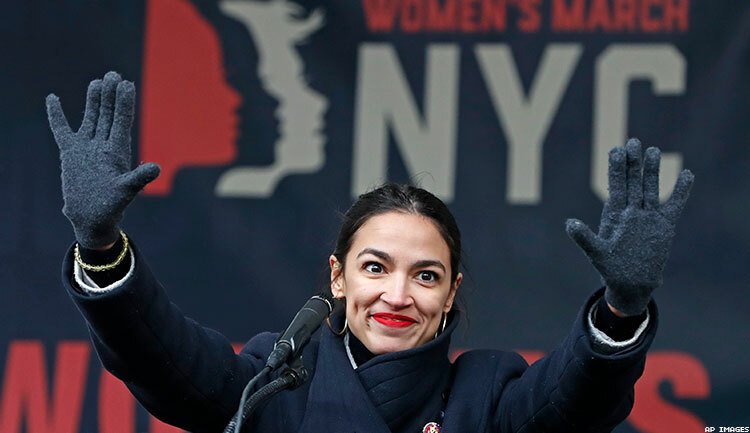 As Women’s Marches proceeded around the nation Saturday, with thousands attending despite controversy over the march’s national leadership, a New York event was marked by a fiery, inclusive speech by freshman Congresswoman Alexandria Ocasio-Cortez. The New York Democrat also touched on the environment, voting rights, the water crisis in Flint, Mich., and several other topics. There were two events in New York City. The Unity Rally, from which the video is drawn, was planned by a group affiliated with the national march. An independent New York group also held a march in the city. Ocasio-Cortez attended both events. Meanwhile, a national march proceeded in Washington, D.C., with other marches in Des Moines, Denver, Los Angeles, Seattle, and elsewhere. Chicago was the site of a Young Women’s March Rally after the city’s official Women’s March organization decided not to hold an event, citing costs and security problems, and encouraged other groups to hold independent gatherings. Today marked the third annual series of marches, which began in response to the election of Donald Trump as president. Many prominent Democrats stayed away from the marches, but Sen. Kirsten Gillibrand of New York, who is seeking the party’s presidential nomination, attended the event in Des Moines, in a state -- Iowa – that holds an early presidential caucus, CNN reports. She addressed concerns that national march leaders had allowed anti-Semitism to taint the movement, given the association of some with Nation of Islam leader Louis Farrakhan, who is known for anti-Semitic, misogynistic, and anti-LGBTQ rhetoric.